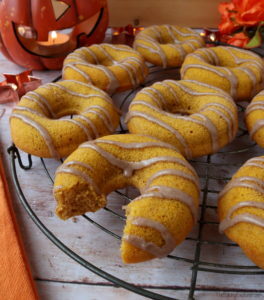 I absolutely love pumpkin spice, and baked donuts are one of my favourite things to make. They’re also really easy to make! 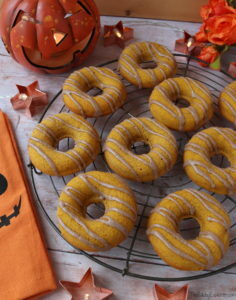 So Pumpkin Spice Baked Donuts are the perfect combination for me. 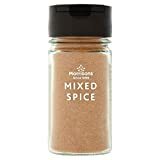 They are packed with Autumn spices like cinnamon and nutmeg, they are deliciously moist and drizzled with a sweet cinnamon icing. 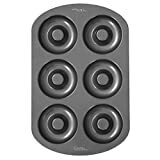 Grab yourself some donut pans to make this recipe (check the Amazon link towards the end of this post) and you’ll be surprised at how easy they are to put together! 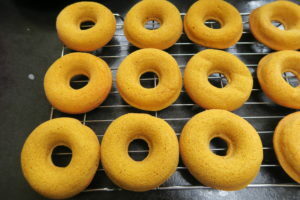 To make the donuts I mixed together eggs, pumpkin puree, caster sugar, vegetable oil and milk. 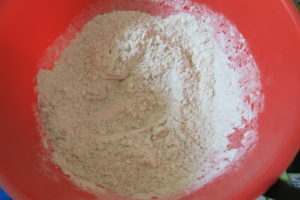 In another bowl I stirred plain flour, cinnamon, mixed spice, nutmeg and ginger together. 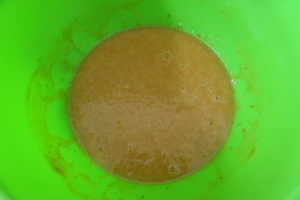 I added the dry ingredients to the wet ones and whisked until smooth. 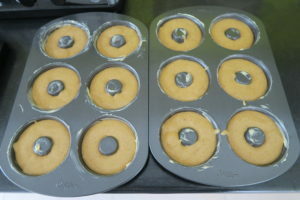 Then I poured the batter into my greased donut pans and baked for 12 minutes. When they were baked I put them on a cooling rack to cool completely. I made cinnamon icing for the donuts by adding water to icing sugar and cinnamon. 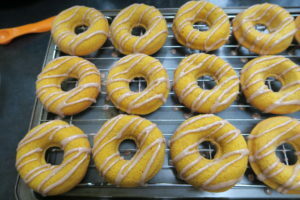 Then I drizzled it over the Pumpkin Spice Baked Donuts. Wow these Pumpkin Spice Baked Donuts were tasty! They were light, moist and full of spices. My friends and colleagues loved these donuts, and many yummy noises were made! I do find you just can’t eat one! 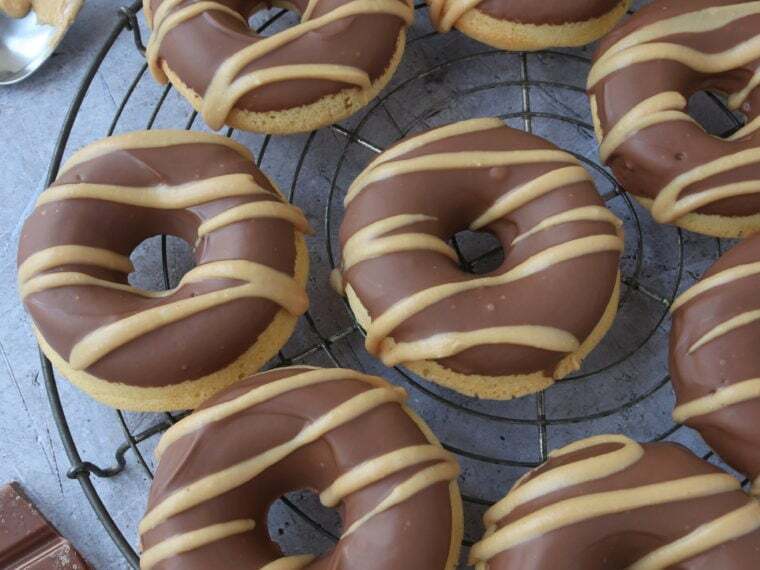 I never knew you could bake donuts! Would definitely like to try these if I ever got a donut pan. Have to say I really admire your drizzling skills – I can never get it right and they always end up all blobby! Yes it's amazing and so easy! My tip for drizzling is use a fork, it drizzles quite nicely I find. These look delish! I love the wilton donut pan! Thanks Kerry! It's amazing, I love it too! Love this article! I love to read your blogs. I am so excited to try this recipe. 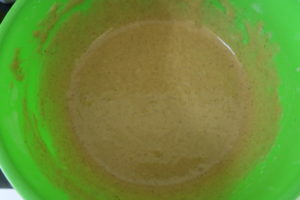 It’s look amazing and so easy to make through follow your instructions. Instructions are clear and well written. Thanks a lot for sharing.